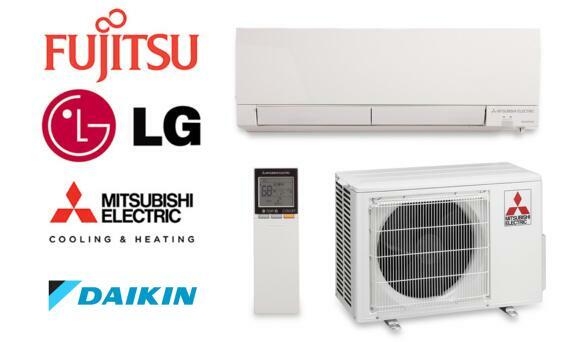 This guide compares best-selling 1-ton mini split systems from the four leading brands: LG, Mitsubishi, Fujitsu and Daikin. This isn’t a comparison between good and bad equipment; the comparison is between four excellent mini split heat pumps to determine which is best. At the end of this comparison of Daikin, Fujitsu, Mitsubishi and LG, we have provided links to our individual guides to each brand. We cover all the essentials: Cooling and heating efficiency, sound levels, warranties, operating range, price, features and more are compared head to head. Our approach: For the best comparison, we chose popular 12K BTU models in the high-SEER range. Each brand makes units that are less efficient, and all but LG make more efficient heat pumps. The models offer the best value – a combination of good efficiency without premium cost. Wall units are the most common indoor units for single-zone mini splits. A full explanation of the differences is found below. Here is the overview of the head-to-head comparison between these popular models. We’ve bolded the best ratings and features where there is a difference. Let’s break down that chart to show how these units compare in similarities and differences. The table shows many similarities – wireless remotes, auto restart after a power interruption and fans that adjust automatically faster or slower to match compressor performance. There are a few worth discussing. Inverter technology: It’s not listed on the table, but worth noting that all these units use have inverter-driven compressors, as do most mini split heat pumps. They compressors modulate up and down in small increments as needed to keep indoor temperatures precisely balanced as outdoor temps rise and fall. Only high-end standard split system heat pumps have inverter/variable-capacity compressors, and prices start above $2,000 for them. You may also be interested: Will AC Efficiency Skyrocket with Inverter Technology? Auto-variable fans: This means that the fan switches speeds automatically, rather than you having to do it manually like you might on a window AC, to match compressor speed/capacity. Multiple filters: All units have a filter that stops general allergens and another that traps odor-causing particles and breaks them down, so they won’t create foul odors in your home. These filters are washable. In fact, these manufacturers recommend washing them every week to every month depending on use. This is a level of maintenance not needed with standard split system air handlers. Timers: Daikin is the only model with a 7-day timer. The others have 24-hour timers. These timers allow you to control heating and air conditioning when you’re away or asleep. Most homeowners find that a 24-hour timer is sufficient. While similar in many ways, there are differences worth pointing out too. As noted, we chose models in the upper-middle range of efficiency. 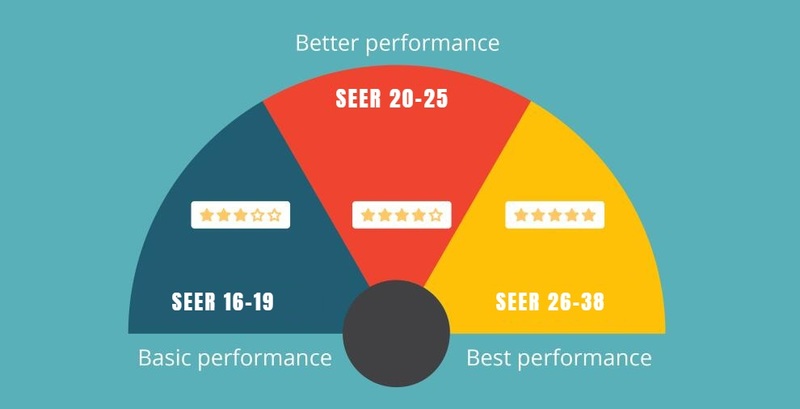 As a brand, Fujitsu is tops, and its most efficient unit is rated 38 SEER, the highest currently available. Mitsubishi makes a unit in the mid-30s SEER. Daikin makes one unit more efficient than this at 26 SEER. The LG model used here is currently the brand’s most efficient. How much does efficiency effect operating cost? The least efficient of the four, the LG LSU, is 5% to 7% less efficient than the others. This means it will produce monthly energy costs $7 to $12 higher depending on local electricity prices. The LG unit is also the most affordable. The $205-$240 saved compared with the others will be spent on higher utility bills in 17-34 months for the average home. After that, the lower efficiency of the LG model will cost you money. Our choice for efficiency: Mitsubishi. The Mitsubishi model in this comparison has the lowest cost to efficiency ratio followed in order by Daikin, Fujitsu and LG. WiFi control: The Fujitsu, Daikin and LG mini split models stand out for WiFi as an option. Using a smart device and the app allows you to monitor and control your system from anywhere, so you can turn it down if you forgot to do so when leaving your house and turn it up shortly before you arrive back home. The feature saves you money and ensures your home is comfortable when you arrive. We think that’s an important feature. The technology is available, so it makes sense to use it for energy savings and indoor comfort. Occupancy sensor: The Daikin and Mitsubishi indoor units include motion sensors. When the sensor determines a person has left the room, it will put the system into an energy-saving mode, boosting heating or AC again when a person enters. It’s standard on the Daikin and an option on the Mitsubishi. This is another important feature, we believe. Fan speed: LG has one more fan speed than Mitsubishi and two more than the others, so fan speed more closely follows the capacity at which the compressor is working. We noted these compressors speed up and slow down as needed for balanced heating and air conditioning. More fan speeds allow for closer tracking. This will make a slight difference in indoor comfort that some wouldn’t notice. 100% heating: The 100% heating lines show the temperatures to which you can expect 100% effectiveness before the unit can’t keep up. Mitsubishi, LG and Fujitsu have slight advantages, but those are irrelevant to most climates. Our choice for features: Daikin. The Daikin RXS12LVJU & FTXS12LVJU combination mini split system has more of the features we think are most important including a 7-day timer, occupancy sensor and WiFi. The mini split HVAC industry calls noise “sound pressure,” just so you know what the information is talking about as you visit brand sites. The sound pressure of the outside units is less important. They’re all quiet enough to not be heard when you’re inside. It’s the noise level of the indoor units that is more significant, and here there is a large difference. The Mitsubishi model has a clear advantage over the others followed by the LG, Fujitsu and Daikin models. Our choice for noise: Mitsubishi. The 34 decibels of the indoor unit is quieter than the LG model and much quieter than the others. There are real differences here too. Daikin’s 12-year total coverage is the best in the industry, slightly better than Mitsubishi’s 12/10 coverage and Fujitsu’s 10/10. LG lags behind. Note: Until April 1, 2015, the Mitsubishi warranty was 7 years on the compressor and 5 on parts. That’s the warranty coverage for units installed prior to April 1. The better warranty began at that time. Our choice for warranty: Daikin, though Fujitsu and Mitsubishi are very good too. LG’s warranty is the shortest, but LG is also the most affordable of the four. The longer you plan to live in your current home, the more it makes sense to pay more for a unit with a longer warranty. If a move is in the plans, then the LG unit offers better value in the short-term. Because all these units are sold by many local and online retailers, prices will vary, sometimes by as much as $200 per system. We use average retail prices for our comparison. Shop around when you buy to find the best equipment costs. These are competitively priced units, with the LG being significantly more affordable wherever you compare costs. The cost difference is largely due to the LG being the least efficient and having the shortest warranty coverage. We’re not as concerned about quality. Our choice for price: The prices are clear to see. As we said, take into consideration how long you plan to live in your current home when deciding the price you’re willing to pay. You might say that you can’t go wrong with any of these…but that leaves the issue unsettled. There are two ways to look at it: Long-term and short-term. The Daikin system has the most to offer. But it is also the most expensive. If you’re planning to stay put and want high efficiency, the best warranty protection and top features, then Daikin is a great choice. If you think you’ll move in the next 5-7 years, then cost might be more important than warranty or efficiency. The LG LSU120HSV5 / LSN120HSV5 system is a good-quality unit that should serve you well for that time period. It is also a cost-effective option for locations where it won’t get heavy use – a vacation home, guest apartment or those few regions like much of the California coast that have moderate temperatures all year long. We say you can’t go wrong with any of them…except if it isn’t properly installed. There are variables that go into any installation that will affect durability and indoor comfort. These include correctly installing the equipment, determining the right location for the indoor unit and properly charging the system with refrigerant. These variables are why it is important to hire a certified installer that is licensed, insured and very experienced. If you’d like to quickly and conveniently get estimates from top installers in your area that know they are competing on price, use the Free Local Quotes button or call today. Here are the guides mentioned above.